Last October 24 is a very memorable and grandiose celebration of Enchanted Kingdom's Anniversary. But despite the thick number of people inside the theme park, I'm sure that Celebrities also took the liberty to visit EK on its Anniversary celebration. We did sight a lot of celebrities that day inside Enchanted Kingdom. Some of them are personally invited and some are just their to relax and have fun. Nonito and Rachel Donaire strolls the park before thay head to the Eldars tent for the CEO party. Getting cozy with the Maestro, Mr. Ryan Cayabyab. Totally starstruck because he is my ultimate idol in music. Touched by an Angel. Angel Aquino hosted the Annual Sky Wizardry together with Bobby Yan. 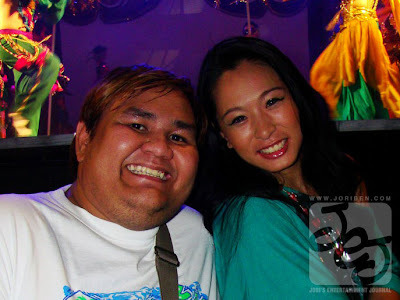 There are a lot more Celebrities who attended that night like Arnel Pineda, Felipe Gozon, Mareng Winnie, and a lot more. This is just one proof that regardless if we are celebrities or just regular average joe, we all still need some magic just to turn our ordinary days to something special. And that magic is found in Enchanted Kingdom.